This is a follow up to our last report based on a tip sent to us by a viewer who wanted to know how it was okay that the largest elementary school in Dallas put up a giant cell phone tower right on the basketball court next to the playground. After we released the video, lots of people sent us tips from one side of the nation to the other. 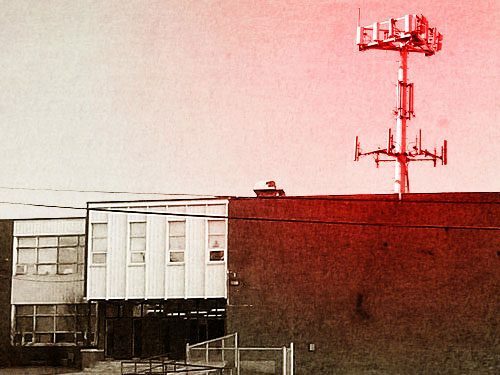 These cell towers are being placed on school property — next to even preschool playgrounds and sometimes directly on the rooftops of the schools themselves — all over America. With no long-term studies for safety, troubling health data pointing to everything from cancer to negative impacts on the immune system to impairing hormone function — why? Why is there such a concerted, nationwide push to place these dangerous towers right next to our growing children in the very buildings they spend all their time in during the week? Well…there is one theory…but you aren’t going to like it. For more on this, check out the source docs on Stopthecrime.net. READ Excerpt, Where Have All the Leaders Gone? Posted in CorporationsTagged Central Intelligence Agency, Technology, Electromagnetic radiation, education, Body, GovernancecommentLeave a Comment on Why Are Cell Phone Towers Going Up on Public Schools All over the Country?